Note: Click here for the latest guide on 2013-2014 Countdown events. This page is outdated and only has last year’s events. Not sure where to party this New Year’s Eve? 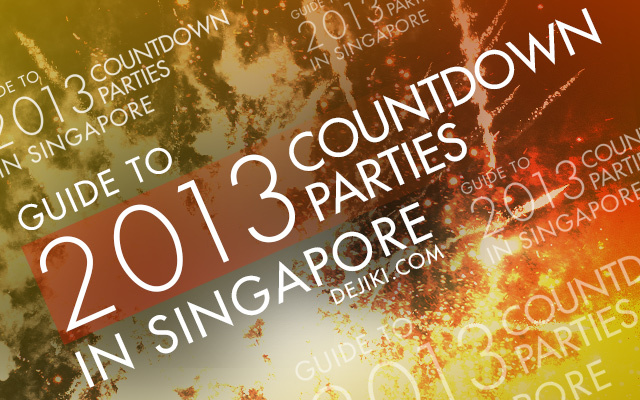 Here is a handy guide to the 2012-2013 countdown parties in Singapore! This entry will be continuously updated as new information is available. Do bookmark this page and check regularly for updates. Siloso Beach Party is Asia’s largest beach countdown party. This is also the longest party (12 hours long), and of course, is the only party in Singapore that takes place near the sea! Count down to a sensational 2013 with 12 hours of non-stop action at 5 distinct party zones, our giant foam pool and sandy dance floor! Party goers can indulge and party to music that they love, whether it’s dancing to heart-pounding hits at the Main Arena, chilling out to lo-fi and beach house tunes at COASTES, indulging in plush party sounds at Azzura Beach Club, surfing to the rhythm at Wave House Sentosa, or grooving to a mix of Latin Jazz at the new beach bar, Mambo, we have the tunes and spoils to satisfy every musical whim! Enjoy exciting fringe performances and fuel your energy with the wide array of food and drinks! The whole hosts of activities will satisfy your appetite for entertainment till the break of dawn. The Siloso Beach Party is the only year-end countdown event set against the allure of the sea front; it’s the place to be this New Year’s Eve! Minimum age of entry is 18 year old. * Booking fee applies for tickets bought online. This year’s countdown party at USS will feature two party zones at New York and Hollywood. Tribute artistes will perform the hits from Adele, Lady Gaga and Michael Buble. This is a nice change from the “oldies” USS Countdown in 2012 (Trip Report: Boogie Countdown at Universal Studios Singapore). *USS Day-Pass guests can enjoy the park’s attractions from 10AM. While the park is open from 5pm for the party, Supernova Countdown shows will begin from 6:45pm. It’s Universal Studios Singapore! USS countdown party in 2010/2011 seemed to be a great hit. Most rides and attractions will be open all night! Largest family-friendly countdown party in Singapore. No minimum age of entry. However, young children should be accompanied with adults. Unlike last year, the same price applies for guests of all ages. Given the high ticket price of the Party Pass, it makes more sense to just purchase a Day Pass and be at the park early in the day (I guess this is what the park is planning anyway). It makes more sense especially when there isn’t Child/Senior pricing for the Countdown party. *These discounted tickets are only available for onsite purchase at Resorts World at Sentosa. Please show valid credentials (Student Pass or USS Annual Pass cards). This add-on will start from 6pm and ends by 12.30am. Guest can collect their free flow drinks wristband from KT’s Grill, Hollywood China Bistro and Counter in front of USS Guest Services counter with the confirmation letter. Organised by Urban Redevelopment Authority (URA), Marina Bay Countdown has been held for many years. It still keeps its features, such as the floating balls at the Marina Bay area, free fireworks show and various other activities around the area. *Event organisers did not state the time. Celebrate 2013 is a concert/party featuring local (and some foreign) artistes. It will also be shown live on Mediacorp Channel 5 from 11:00pm on New Year’s Eve. Do bookmark this page and check regularly for updates. Also, if you know of an event that I should include here, please send me a message or leave a comment so that I can update this entry.